If you are having a new Fireplace installed in your home, make sure the company installing it is a reputable company to assure it is installed properly. Obtain a permit from your local Municipality / City / Township. 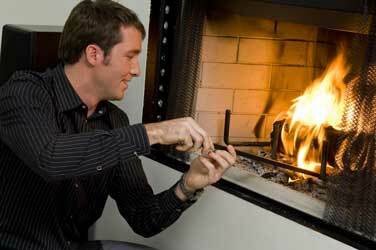 If you presently have a fireplace, have it checked for cracks, and that the damper is working properly. Have the chimney inspected annually, and cleaned if needed. Only burn hard woods, as soft woods will produce creosote, and block the chimney. Never start a fire using flammable liquids. Never burn charcoal. Burning charcoal can give off lethal amounts of carbon monoxide. Have a metal screen or glass in front to prevent sparks from jumping out. If you use synthetic logs, follow manufactures instructions. Never break them in small pieces and only burn one log at a time. Before going to sleep, be sure your fireplace fire is out. Never close the damper with hot ashes in the fireplace. This will force toxic carbon monoxide in your home. When removing ashes from the fireplace, place them in a metal container, and put them outside, a safe distance from the house. Never put them in plastic containers or containers containing trash. Have a FIRE EXTINGUISHER accessible to the area where the fireplace is located, and have it checked annually. Know how to operate it. Have a CARBON MONOXIDE DETECTOR located outside your sleeping area. Be sure to have SMOKE ALARMS on each level of your home, outside your sleeping area, and test them monthly. If you have a problem with the fireplace, or think you have a chimney fire, get everybody out of the house and call 9-1-1.
in using your portable heater safely. When purchasing a new electric heater, be sure it is UL or FM listed. Try to use the heater without using an extension cord. If you need to use an extension cord, make sure it is heavy enough to carry the amp load. If you are not sure, get professional advice. If you use an improper cord, it could overheat an cause a fire. Always check cords for cracks and bad plugs before using. When you plug the heater cord in the electrical outlet, if the lights in the room dip, shut it off immediately. This shows you are overloading the circuit. Get professional advise to assure the proper circuit breakers / fuses are the correct type in the main electrical panel for this type of use. 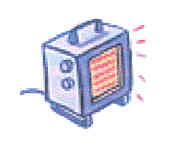 When using the heater, keep a safe distance from all combustible items. Avoid using electric heaters around water, especially in bathrooms. Keep all children away from the heater. They could get a shock or burned. Be sure to have working SMOKE ALARMS on each level of your home, and outside your sleeping area. Test them monthly. If the cord or plug becomes very hot, shut the heater off immediately. Should the heater or cord start smoking, get everybody out of the house, then call 9-1-1. The majority of fatal home fires happen at night. The smell of smoke won't always wake you up, in fact, smoke and poisonous gasses can put you in a deeper sleep. Home smoke alarms can wake you in time to escape. Follow these rules, and they will help you to get out of your house safely in the event of a fire. Selecting a smoke alarm for your home. Some smoke alarms operate on batteries, and some are wired to the house electrical system. The ideal setup is wired to the house electrical system, with battery backup. When purchasing the smoke alarms, be sure they are UL or FM listed. Install a smoke alarm on every floor of your home, including the basement, and outside each sleeping area. If you sleep with the bedroom door closed, you should have one in the bedroom. Smoke alarms should also be located in family rooms, dens, living rooms, other living areas, and at the top or bottom of all stairways. If someone in your home is hearing impaired, you can install a smoke alarm with a louder alarm, or a smoke alarm with a flashing light as well as the alarm. When installing the alarms remember, smoke rises, so the smoke alarm should be located high on the wall, or on the ceiling. Never place them close to a forced air register where drafts could interfere with its operation. Smoke alarms should not be located where cooking fumes, steam, or automobile exhaust might set off a false alarm. Smoke alarms should be tested monthly, or by manufacturer's recommendations. The battery must be replaced yearly. Never remove the battery from the smoke alarm for other uses. If the smoke alarm should sound, and their is no visible smoke, investigate and try to determine what activated the alarm. If you have a doubt, call 9-1-1. If the alarm sounds and smoke is present, get everyone out of the house. Have a designated meeting place outside the house so everyone can be accounted for, and have someone call 9-1-1. If you have any questions about your smoke alarms, what type to get, where to locate them, etc., call your local fire department or the Atlantic County Office of Fire Safety at (609) 407-6741. Due to the high cost of fuel energy, many people are installing wood stoves to supplement their present heating systems. 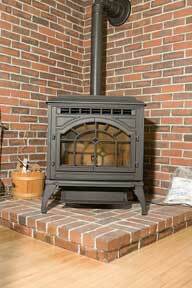 It is very important that the wood stove be installed properly. A improper installed stove can cause a fire. Obtain a permit from your local code enforcement office, before installing the wood stove, and have a certified company install it. For further information call Atlantic County office of Fire Safety at (609) 407-6741. If you presently have a wood stove or fireplace, pick-up a free fire safety informational pamphlet at any Atlantic County Library. Visit www.atlanticlibrary.org for branch locations and hours.